Probate is the court-supervised process of settling an estate and distributing the remaining assets to beneficiaries following a property owner's death. An administrator is a court-appointed personal representative assigned to probate the estate when the decedent dies without a will (intestate) or fails to name an executor of his estate. By operation of law, the title of a decedent passes to her devisees or heirs upon death, subject to a lien of the administrator for payment of debts, expenses of administration, and other expenses legally chargeable against the estate. If the decedent's debts outweigh his assets, the administrator must sell property from the estate. Personal representatives of an estate may not sell real property without first obtaining a license from the probate division of the superior court. Following petition by the administrator, the Register of the probate court executes and records the license in the land records of the town or city where the property to be sold is situated. Following a sale of real property, the administrator executes and records an administrator's deed under 14 V.S.A. 1652. The deed contains covenants of special warranty, whereby the administrator warrants to defend the title against claims stemming from the time the decedent held title to the property, but not before. The administrator also covenants that he is lawfully seized of the property and has been authorized by the court to convey it. A deed by administrator also recites facts about the probated estate, such as the location where it is opened, the date of petition for license to sell, the probate docket number, and a reference to the location where the license is on record. The deed should also meet all state and local standards for content and format of recorded conveyances of real property, such as the grantee's name, address, and vesting information, the consideration the grantee is paying for the transfer of title, a legal description of the property conveyed, the source of the decedent's title to the property, and a list of any restrictions on the property. The administrator must sign the deed in the presence of a notary public or other authorized officer before recording in the appropriate town or city clerk's office. At the time of recording, submit a Vermont Property Transfer Tax Return, with tax remitted to the Vermont Department of Taxes, unless exempt under 32 V.S.A. 9603. 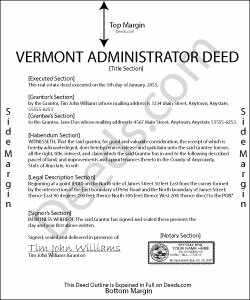 In general, anyone who sells property in Vermont that was held by the seller for less than six years is required to file a Vermont Land Gains Tax Return (Form LGT-178) within 30 days of the sale, even if no tax is due. Contact a lawyer with questions about probate procedures and administrator's deeds in Vermont, as each situation is unique.